The colour is a light garnet, dull-ish - you know from the outset this wine isn’t gonna be big. A touch of VA greets on opening, un-worryingly. A pencilly nose gives way to fruit in the redcurrant and blueberry spectrum, with typical strawberries and cream. It’s a clean (VA aside), fresh, ruby-red style – cedary, floral/spicy, but with little in the way gamey/earth notes of fuller styles. As expected, the palate is light-ish, soft and simple with red-fruits dominating; sweetish mid-palate with spicy notes, rosewater, bay leaf, and tapers away on the finish. All the usual measures are in good shape: acid balanced to fruit-weight balanced to oak treatment. I have to remember this is only $20 so I need to loosen the pinot-wanker-strings a bit. And so I do. OK, add a little rare beef fillet soaked in soy/ginger/garlic/chili and the wine gives a little more. The nose looks sweeter and the palate texture broadens and gives the impression of more weight. The floral aromatics kick up a gear and there’s even a few foresty notes poking around. The base flavours also lift and give a new richness to the whole shebang, even if moderately. Texture is pretty slick. A food wine. 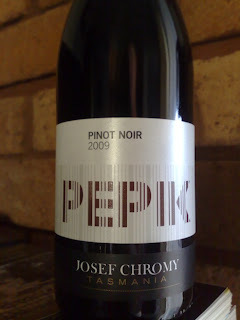 Jeni Port of The Age rated this wine in her best for 2010 – albeit for Best Red Under #20. Weeeell... these ratings are always difficult and the trail marked ‘best wines of the year’ lays strewn with the carcasses of wines that simply don’t stack up. Soooo... with a pinch of salt and a shake of pepper. Honestly? I think it’s a pretty tidy wine. It’s probably more than tidy for $20. Pinot at $20 is a tough category and this one nails all the hard bits and comes through smiling. Not grinning, smiling. I’m OK with it. I’m sure they are too. (Note: 2nd night in and I think it delivers a little more. Perhaps worth a decanter, if you’re so inclined). Value: Cellar door price is $20. As above, it’s hard to do this style well for that price. Easy with Cab and Shiraz, but Pinot is an unforgiving bugger. So, I call it good value. Region: Tamar Valley, Tasmania – 10 mins south of Launceston at Relbia. A beautiful spot. Go visit. Vintage: An average year in the Tamar – temperature swings and a cool flowering season didn’t help the cause, although they managed to avoid the frosts experienced in the south. A bit of disease pressure in parts but all up an OK year and some of the better producers got it right.